At one point during my blissful lomi lomi massage, I actually nodded off and awoke to drool inching down my chin. When I embarrassingly made a comment about it, my therapist Connie kindly complimented me on my ability to drift off, saying that it was a sign of complete relaxation or “malie” in Hawaiian. I, in turn, returned the compliment, noting the expertise of her magic fingers. The tension seemed to just melt away as she worked wonders on all of my body’s knots. That, combined with being in a semi-open air treatment room where I could hear the rustling of the palms and smell the perfumed scent of the flowers, made for a heavenly experience. It was one of many I would have during a memorable stay on the Island of Kaua’i. The oldest of the Hawaiian Islands, Kaua’i is known for its incomparable beauty. The “Garden Isle” has it all, from miles of white sand beaches and crystal blue ocean to rugged mountains, majestic canyons, thundering waterfalls and verdant tropical foliage. But, Kaua’i is more than just a pretty face. You’ll find a diverse array of dining, art, shopping and charming, historic little towns dotting its expanse. And then there are the people, who have the reputation of being among the friendliest residents of all the islands. They welcome you with the true spirit of aloha. As a visitor to this special piece of paradise, you’ll find no shortage of things to do. The scenery sets the stage for an array of activities that not only energize, but challenge your body in a myriad of ways. Recreation reigns supreme with a range of mellow to high adventure options available. If you’re a water baby, there’s everything from snorkeling off the famed Napali Coast and boogie boarding at Kiahuna Beach to kayaking the Hanalei River and mountain tubing down the tropical waterways of the island’s interior. If you’re more comfortable on land, join a bike tour with Polynesian Adventure Tours down stunning Wailea Canyon. At 3,600-feet-deep, two miles wide and ten miles long, this “Grand Canyon of the Pacific” is a true gem, brilliantly layered in hues of red, green and brown. 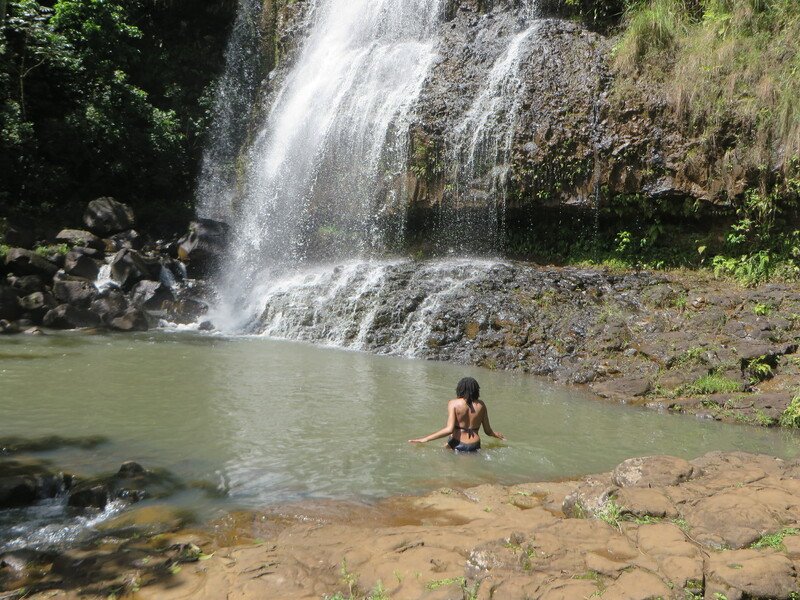 Take a hike at Koke’e State Park, a hiker’s mecca with more than forty miles of trails and plenty of picturesque vistas. 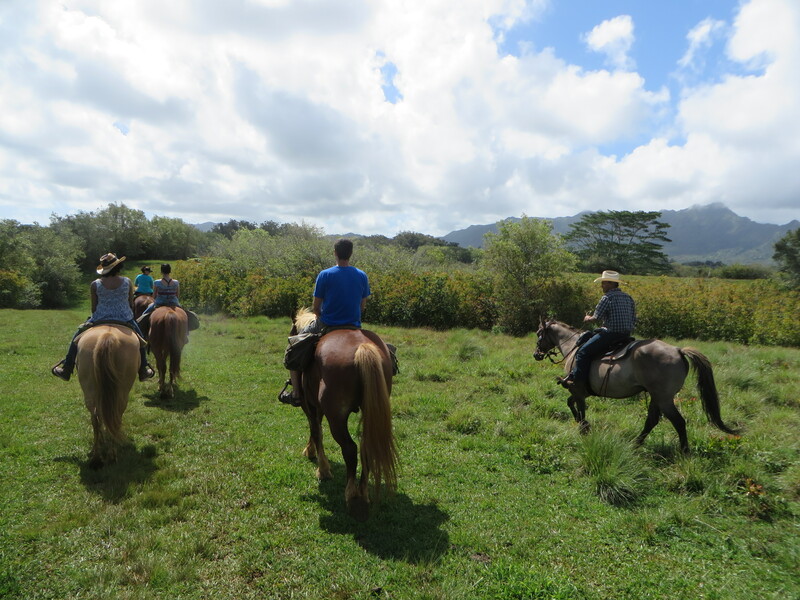 Or hop on a horse for a memorable ride with Princeville Ranch Adventures across a working cattle ranch. Those looking for a unique perspective of the island can go on an exhilarating zipline trek with Outfitters Kaua’i, where you’ll have a bird’s eye view of Kaua’i’s stunning topography. 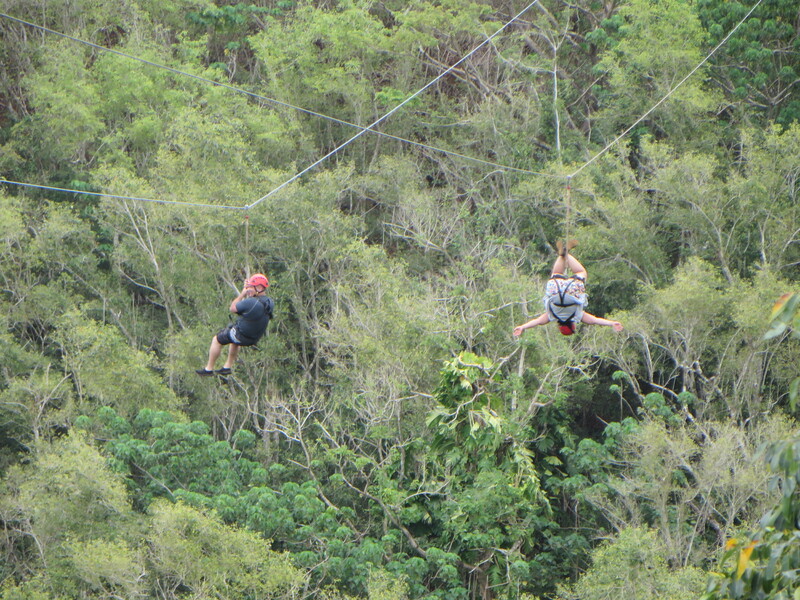 You’ll soar above valleys, rivers and waterfalls ala Tarzan and Jane for a guaranteed adrenaline high. A helicopter tour, however, is the ultimate way to get the lay of the land. It’s definitely a splurge-worthy alternative and one for the memory books. And as long as you’re going all out, make it a waterfall landing excursion. 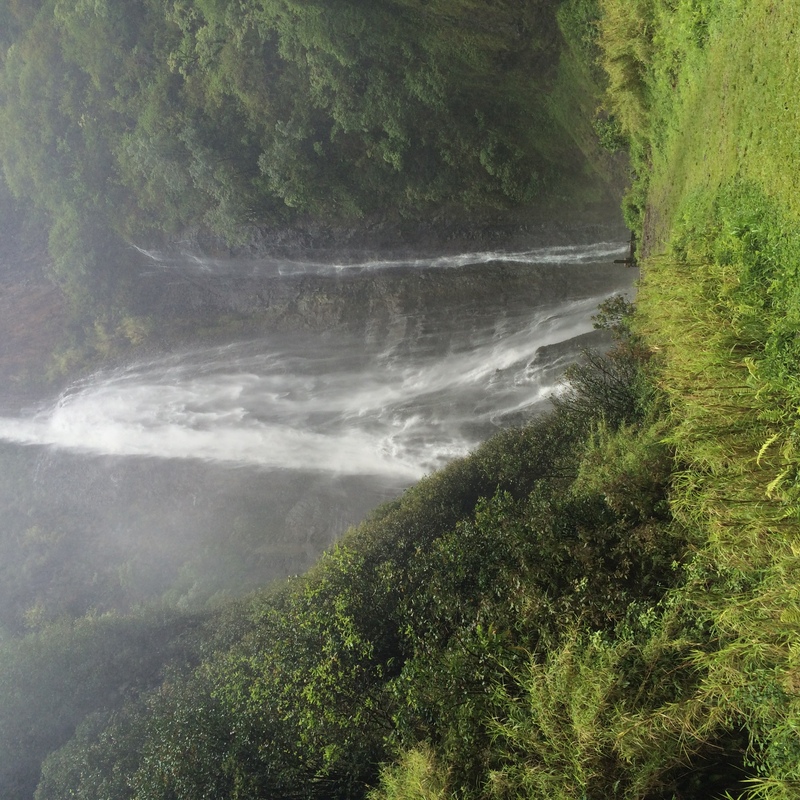 Island Helicopters’ exclusive tour takes you to the 400-foot Manawaiopuna Falls, which was popularized in the movie, “Jurassic Park.” The helicopter sets down in a tropical valley at the base of the falls, allowing you to experience the grandeur of this remote, tropical site. The ride also includes a narrated tour of the island with gasp-inducing views of the Napali Coast and Waimea Canyon. Though it’s definitely an adrenaline junkie’s haven, Kaua’i is also a destination where you can get away from it all and find some much-needed peace. The island allows many opportunities to slow down and smell the plumeria. It’s a place that encourages folks to focus on themselves by carving out “me time.” And in our crazed on-the-go culture, everyone needs to occasionally press the pause button and focus on re-balancing, replenishing and reviving mind, body and spirit. Whether it’s strolling on the beach, watching a spectacular sunset, having a relaxing spa treatment or enjoying a nature walk, the point is to give yourself the chance to work on establishing a bit of inner harmony. Several resorts and hotels on the island actually promote personal wellness via dedicated programs in this vein. At the St. Regis Princeville, for example, meditation and wellness retreats are offered at specific times of the year. They include guided restorative yoga, meditation and pranayama sessions, spa treatments, visits to sacred sites and botanical gardens, farm-to-table communal dinners and more. 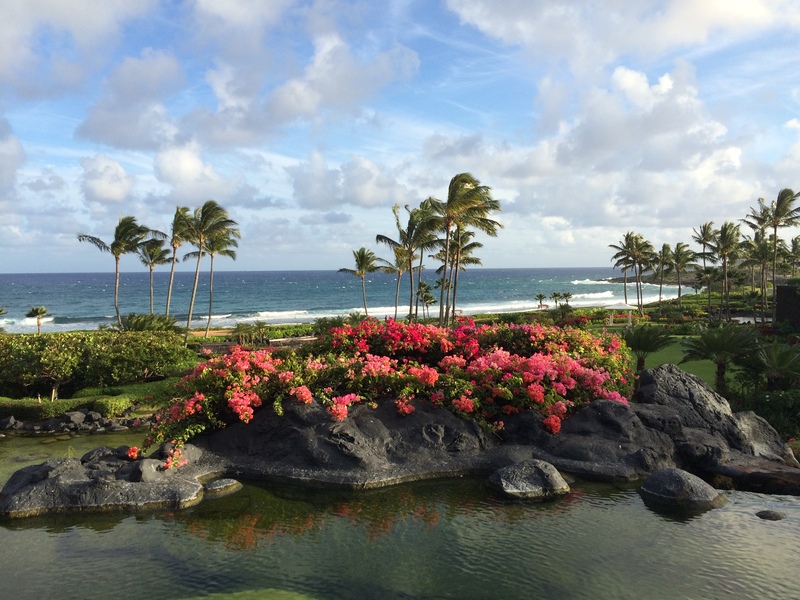 The property even has its own on-site Hawaiian guide to cultural wellness, Puna Kalama Dawson, who invites guests to join her in the age-old morning ritual of greeting the sun as it rises from the ocean. Dawson advocates visitors to be in the moment, be mindful and to take the time to appreciate what we have and to share it with others. She emphasizes the indigenous tradition of using breath or “ha” to quiet the mind, which helps direct us into an awareness of our inner spaces. She also encourages people to be kind to themselves and others, while exercising patience and humility. Wise words that we all can take to heart. 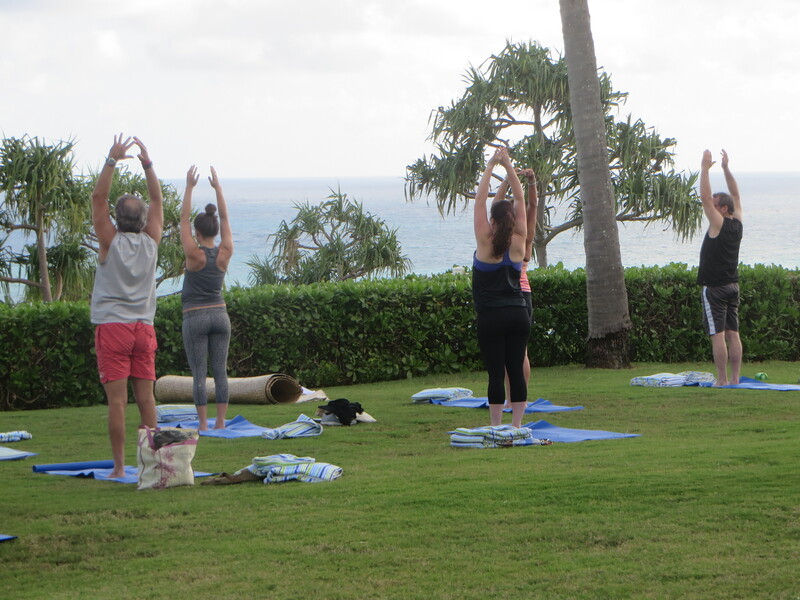 Wellness is also practiced at the Westin Princeville where a “Well-being Movement” is promoted via a selection of “Move Well” activities ranging from yoga and aqua aerobics classes to fitness runs and nature walks. The property’s “Eat Well” program helps to complement these activities. Its restaurants offer Superfoods, those that are both high in antioxidants and nutrient rich, which are denoted in color on the menus. There’s even a “Kids Eat Well Program” to assist children with making healthy food choices. The hotel advocates using locally sourced products whenever possible and works with island farmers and growers to obtain the freshest, in-season, ingredients. At the Grand Hyatt Resort, you’ll find a state-of-the-art gym, personal trainers, an abundance of fitness classes, sunrise walks and the largest spa on the island. Anara Spa is Edenesque in design, with lush gardens, waterfalls and peaceful pools. Practitioners pride themselves on weaving traditional healing customs with island-fresh botanical essences to inspire “lokahi” – balance or harmony of body and spirit. In addition, the Grand Hyatt boasts an “Enrich Program,” which provides opportunities for guests to enhance their vacation through local volunteering. It’s a chance to give back to the island community in a meaningful way and maybe learn a new skill or two in the process. You can spend a day working with plants at the National Tropical Botanical Garden for example, or do hands-on forest restoration projects at Koke’e State Park. With the Surfrider Foundation, you’ll help clean up the beaches and at the Kaua’i Humane Society, you can cuddle cats or take a dog on a hike. Music and dance are also commonly regarded as good for the spirit, and thus successful contributors to wellness. On Kaua’i, there’s no lack of opportunities to listen and participate in either of these arts. Numerous properties on the island have live music at night, as well as offer traditional hula classes for interested participants. Some even provide free ukulele and slack-key guitar instructional sessions, too. There’s also the proverbial luau, which combines song and dance for a theatrical extravaganza. Lu’au Kalamaku at Kilohana Plantation is one of the best. It’s mesmerizing dinner theatre with a dash of Cirque du Soleil. When it’s time to take your leave of this little slice of paradise, do as the Hawaiians do and don’t say goodbye. Just say “a hui hou” – until we meet again.